Coming soon, an event about which I’m very excited! But there’s more! 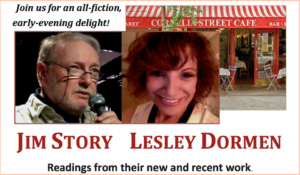 I’m delighted to be sharing the stage with Lesley Dormen, whom I met at a writer’s conference in Italy eight years ago and have wanted to have as a co-reader ever since. Lesley’s novel, The Best Place To Be, was called “delightfully, crushingly funny” by The New York Times, and her work has appeared in The Atlantic, Ploughshares, The New York Times, and many other publications. She teaches fiction at The Writers Studio here in New York. I hope you’ll put our upcoming reading on your calendar in red, and persuade your friends to come, too! Did I mention the date? It’s January 29th; a Monday, the time is from 6-7:30 pm; it’s at 29 Cornelia Street, and as usual, a $10 cover will include a free glass of wine. Check out the Café website, the Facebook Event listing, and my website. This entry was posted in Problems of Translation -- A Novel, Readings & Events, Whatever and tagged #books, book, booklovers, Cornelia Street Cafe, fiction, literature, novel, readings, short stories, The Condor's Shadow. Bookmark the permalink.